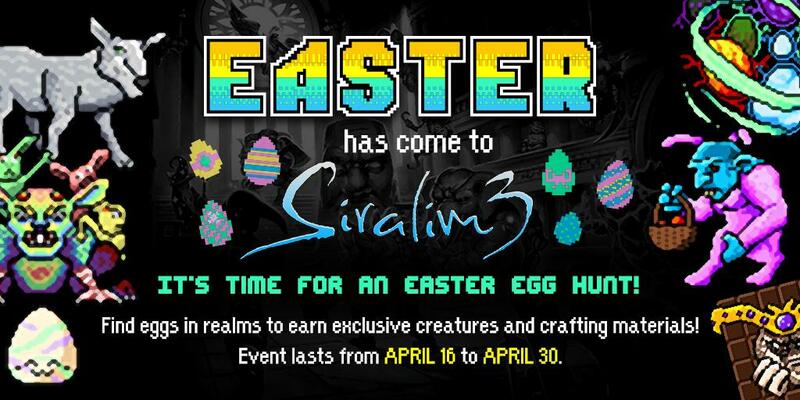 Announcements / It's Easter in Siralim 3! Creatures can only resurrect 15 times per fight (or maybe it's 10), so you could have won (or lost) eventually. Thanks for the info - I'll look into it and fix it in the next patch! Could you please upload your save file to our cloud storage (at the title screen) with the party setup you mentioned and tell me your cloud ID? I still can't seem to make the game crash even with the exact team you described. Can you post the crash log when it happens, please? Thanks for the video. There's a small, intentional delay on option-based dialogs to prevent players from accidentally choosing the wrong option. There's no limit. Have you tried uploading it as a zip file? Is there a specific menu where this occurs? I've been playing the PS4 version quite a lot and haven't noticed this, so maybe it's a menu that I don't regularly use. I'm sure I tried to fix it, but maybe I re-broke it at some point. Unfortunately, no. They don't typically allow digital-only games to have a platinum trophy unless you're granted one via a special request. I even tried to sneak one in and see what would happen, and it failed certification because I'm just not allowed. Yes, they're implemented. The full list will appear after you unlock one. I'm releasing a patch tomorrow or Tuesday that will cause them to show up without needing to unlock one. It might be some other setting on your TV then (keep "fit to size" for zoom - that's definitely correct). There's not even a way for the game to determine the size of your TV display - so it just "exists" and your monitor is responsible for displaying it correctly. Another idea I have is to turn off "overscan" on your TV if that's an option. Alternatively, you could try going into the "Sound & Display" settings on your PS4 and adjust the "Display Area Setting". Not 100% sure if that will work, but it's worth a try. If all else fails, can you tell me what TV you have? I could do some research and try to figure it out that way as well. You need to adjust your TV's zoom option. Page created in 0.171 seconds with 60 queries.